Gloucester Road branch of Pigsty now open! 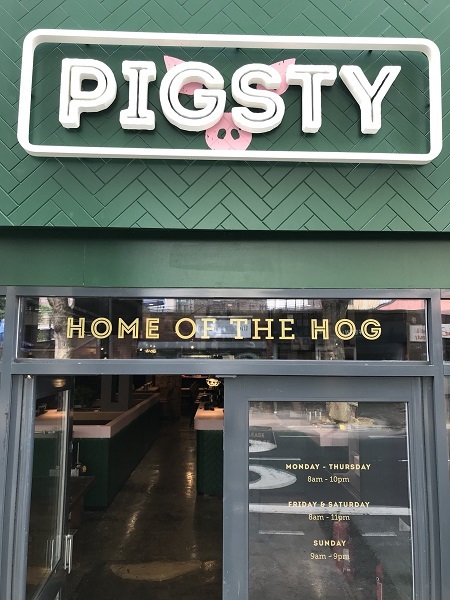 Fans of all things pig will be pleased to know that Cargo favourite Pigsty have now opened a second branch of their meaty dining venue, this time on Gloucester Road. You’ll find the second Pigsty restaurant at 79-81 Gloucester Road (where Bubalu used to be). The doors first opened on May 25th, and the place is open seven days a week: 8am to 10pm Monday-Thursday, 8am to 11pm on Fridays and Saturdays, and 9am to 9pm on Sundays. Plenty of the star dishes from their Cargo restaurant still feature on the menu – Breakfast in Bread, the Pig Mac burger and their epic Pig Board that’s made for sharing, among others – but there are some brand new options too (see the full menu on their website). Vegetarians and vegans are well catered for, and there’s a small selection of beers and ciders from the likes of Wiper & True and Hunt’s Cider, along with wines, spirits and soft drinks. You can see what we thought of the Cargo Pigsty restaurant here. We’re predicting that the Gloucester Road restaurant will be popular – follow the guys on Twitter, Facebook or Instagram to see their latest updates!